Where to begin? That was the question about 8 weeks ago when it became painfully apparent that the house packing elves were not about to make a house call and try as I might to forget about it, the move to a new home was inevitable. After much procrastination, I decided that the china cabinet was the first logical place to start. I was convinced that all of the items precariously perched on the glass shelves would not be needed during the upcoming eight-week transition and that it would take me no time at all to clean, wrap and box everything up. Anticipating the upcoming journey which would include working full time, teaching PQP on alternate weekends and using all spare moments to organize and pack, I wanted a quick “check mark” in the done column and the china cabinet was going to be my vehicle to that goal! So, with tape dispenser in hand, a pile of newsprint and a stack of boxes waiting to be filled, I was set to go. The wine glasses and various sizes of plates quickly disappeared into the boxes without a moment’s thought. But then as I transitioned to the next section and started to extract pieces of crystal (wedding gifts from 30+ years ago) figurines (especially the one with an armed glued back on following a fall from the mantle) and vases I found myself slowing down and reminiscing as each piece was wrapped and carefully placed in a box. It was the third section of the cabinet that held the most precious items and that’s when the packing seemed to come to a halt. 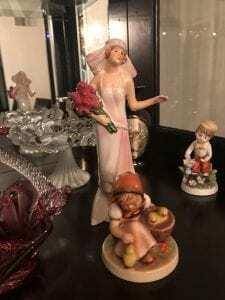 The cranberry crystal, the Royal Doulton figurines and the Hummel figurine of the little girl feeding the chickens ~ all given to me by my grandmother ~ reminded me of that very special relationship. Years after her passing, she is still that voice in my head when I’m unsure that I’m worthy and capable. A flood of memories overtook me. A camel from Abu Dhabi, a silver angel and a napkin holder from the Dominican Republic may look unimpressive to others, but to me they hold treasured memories of the very special individuals who took the time to gift them to me. Each gift had a story and that story replayed in my mind as I carefully wrapped, placed and packed the final contents of the china cabinet. Hours later I was able to give myself a “check mark” in the done column, but it came with an unintended journey down memory lane. I came to realize that the task was never about the check mark, it was about the journey down memory lane. A few days later, I came upon this blog post from a few years ago Leadership is not a checklist. It captures what I truly believe about our role in education. Leadership should never be devalued to the level of a mere checklist. If we spend our valuable time just going through the motions of rushing to check things off of our “to do” list, we will miss the good stuff. We won’t be present to receive the day to day presents which come in the form of relationships with staff, students and community members. Those are the things that we will hold near and dear to our heart years from now ~ not the fact that we systematically went through the motions and completed our check lists. And without those relationships, how can we possibly effectively do our job of inspiring and supporting others? Over the years I’ve come to learn that quick check marks, whether in leadership, learning or life rarely lead to anything other than an empty sense of fulfillment.